Help organizations assess their current DevOps competency gap. The role of the IT professional will become more generic as DevOps teams develop and IT people become more multi-skilled. DASA identifies three broad areas of expertise, and developed a certification program designed for each profile. These programs test the practical skills and experience of professionals who feel most related to these profiles. Builds an understanding of DevOps: scope, key concepts, terminology and principles behind DASA DevOps. 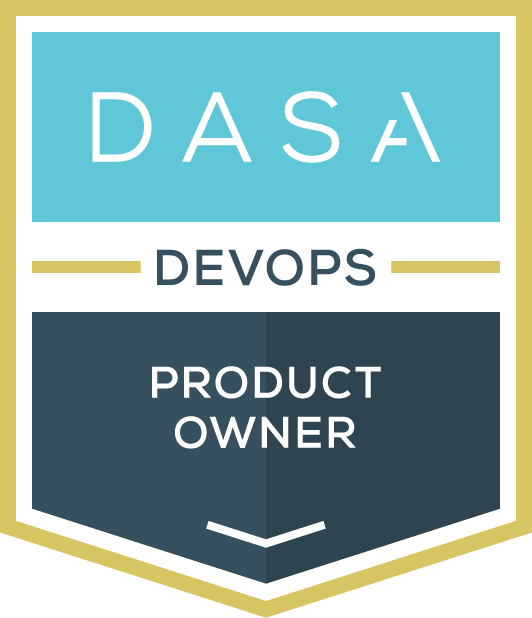 The DASA DevOps Fundamentals program is the only program at this level, and provides an entry point for everyone working in DevOps these profiles. Builds the capabilities relevant for professionals working together in a DevOps team. With these certifications, DASA helps professionals understand how to use the toolbox available to them, and when to use what specific tools. There are three Professional certifications: Enable and Scale, Specify and Verify, Create and Deliver. Where the Professional programs focus on capabilities, this level focuses on the abilities to lead and enable. This program is for DevOps Leaders who lead organizations, Coaches who support the transformation, and Product Owners who are in charge of product lifecycle management. Foundational level DevOps training is the starting point for an organization going on a DevOps journey. Improved workflows and faster deployment starts with a core understanding of DevOps fundamental concepts by anyone involved in an agile and/or DevOps team. 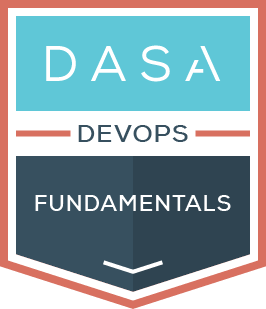 The DASA DevOps Fundamentals certification provides an extensive introduction to the core agile DevOps principles covering the essential knowledge and skill competences that have been defined by DASA. 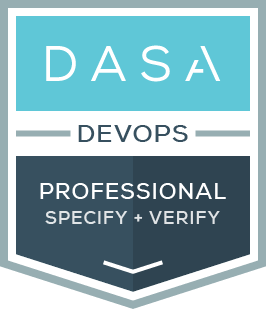 The DASA DevOps Professional specify and Verify certification focuses on ensuring that the requirements of the customers are fully understood and brought into the team so that these requirements can be integrated into the IT product or service being delivered by the team. The following knowledge areas are covered: Business Value Optimization, Business Analysis, Architecture & Design, and Test Specification. The DASA DevOps Professional Enable and Scale certification validates that the candidate has a practical understanding and experience in leading DevOps teams and enables members to become effective ensuring the team works optimally. DASA recognizes four major skill areas: Courage, Team-building, DevOps Leadership, and Continuous Improvement. The DASA DevOps Professional create and deliver certification addresses the heart of a DevOps team, as it focuses on Programming, Continuous Delivery, Security, Risk & Compliance and Infrastructure Engineering. Most team members will have this profile, and be interested in this certification. DASA offers three distinct Leadership certifications as part of the certification scheme. The Leadership level does not cover the practical tools and capabilities covered in the Professional Certifications, but focuses on leading and enabling. It helps the individuals in these roles navigate within their organization and drive the best decisions forward. In a DevOps environment, the Product Owner is a critical leadership role and responsible for managing the full lifecycle of a product from concept to grave. This certification program helps the Product Owner realize maximum business value, engage with stakeholders, and deal with future requirements as well as operational challenges. The DevOps Leader is responsible for leading the DevOps initiative, and creating the framework for teams to scale and achieve maximum business value. This certification program helps leaders understand leadership in the context of DevOps, discusses leadership development models, building teams, and transforming the organization. The DevOps Coach helps team members and other stakeholders in the organization apply DevOps concepts and principles within their organization. The coach oversees the transformation and guides the organization through their journey in building high performing teams. 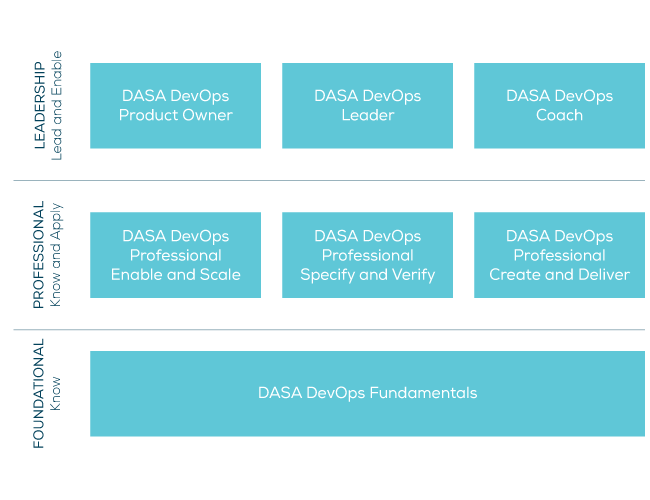 The DASA Competence Model identifies 8 knowledge areas and 4 skills and behavior areas that are relevant in DevOps. Every professional operating in a DevOps team requires all 12 competencies in varying degree.